We are happy to announce that we have added a new feature to our donation platform! Now, organizations can ask their donors to cover processing fees for their donations. 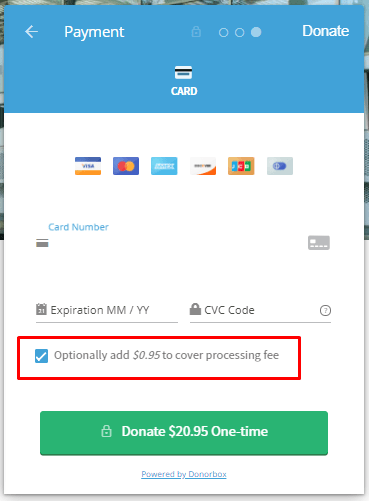 This covers the 2.9% + 30c credit card processing fee from Stripe or Paypal (this fee can be reduced for registered nonprofits), as well as the 1.5% platform fee. As a reminder, organizations only have to pay the platform fee once they reach $1k in donations for a month. However, for simplification purposes, this option will include the 1.5% no matter the amount raised. Processing fees can quickly add up for nonprofits, and no one wants to pay to receive donations (that’s why you chose to use Donorbox, the cheapest donation platform out there, in the first place). However, as you can see below, your donor would only have to pay an extra $4.09 for a donation of $100. This option thus only slightly increases their donation amount, all the while doing you a huge favor. Of course, this is optional for both you and your donors: you do not have to include this option on your form, and if your donors would rather not pay these fees, they don’t have to. Log into your Donorbox dashboard and click on the “Edit” link next to your campaign form. Go to the Advanced tab. Select the option marked “Ask donors to cover processing fees“. This will add the option to the checkout screen of your donation page. 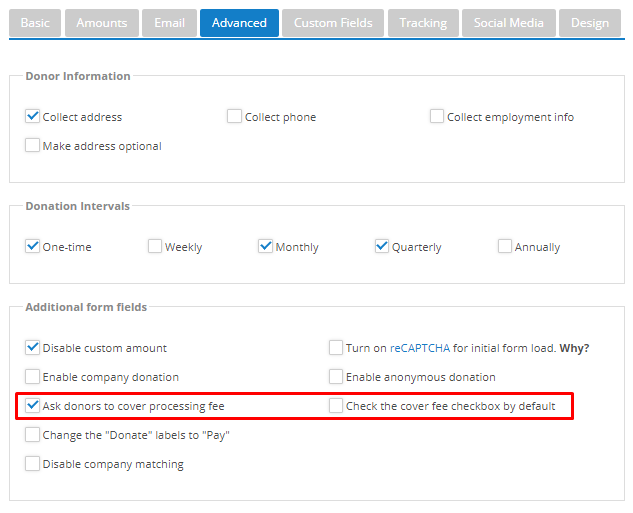 You can also have this option selected by default by selecting the setting marked “Check the cover fee checkbox by default“. Hit Save when you’re done. And that’s it! When asking a donor to cover the processing costs, is that additional amount donated also subject to processing fees? In that case, $3.64 (= 4.09 – (4.09*.029 + .3 + 4.09+.0089)) of the additional $4.09 would go towards covering the processing fees for the $100 donation. Is it possible to set a recurring donation of $1?